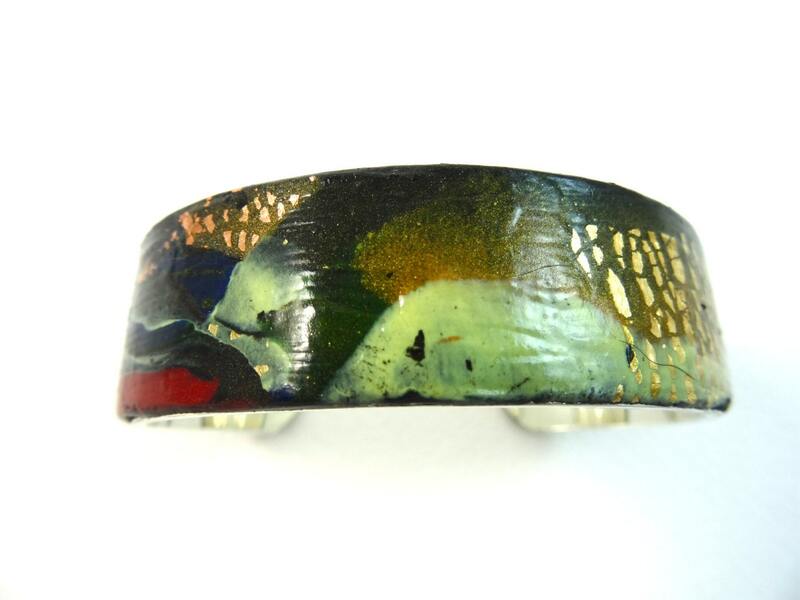 Contemporary and abstract polymer clay bangle design. This bangle design is available in gold-plated, silver-plated, and copper-plated on pewter (sterling silver is also available for custom order only). The polymer clay designs vary in colors and style. Gold, silver or copper leaf may also be added to the various designs. All bangles are finished by a thin layer of varnish. These polymer clay pieces are made by me, Sanya, using different color slab of polymer clay, pressing them together to create an abstract piece. Then polymer clay cane designs may be added or pieces of metal leaves or metal powder. Metals used are copper, silver or gold. Then the combination is pressed and shaped to fit the metal supporting designs before the whole is baked at low temperature. The final touch is to varnish the polymer clay final design as well as the back of the metal support on occasion to prevent tarnishing. All is assembled withe the various components that make the piece (ear hooks, clasp, ...). Voila! Would like a different design or colors of polymer clay? metal leaves? Want it a bit longer/shorter? Larger/thinner?